Located near Koko Head at the eastern end of Honolulu, Hanauma Bay is about 15 minutes from Waikiki. Take Kalaniana‘ole Highway (Hwy 72) from Honolulu or windward O‘ahu to Hanauma Bay Road. Limited parking is available above the bay. Taxis are discouraged, but city bus service is available daily to the area. The beach park opens at 6:00 am, except Tuesdays when it is closed. Closing time is 7:00 pm from the first Sunday in April until the first Sunday in October, and 6:00 pm the rest of the year. The MLCD extends from the highwater mark seaward to a line across the bay’s mouth from Palea Point on the left to Pai‘olu‘olu Point on the right. Hanauma Bay was formed by two of the many craters which created Koko Head. The bay’s outer part is the result of one crater, and the inner part is what remains of the second. The craters’ seaward rims were eventually eroded by wave action. Along both sides of the bay, just above sea level, is a wave-cut bench. The beach at the bay’s head has large deposits of the mineral olivine, which results in green streaks near the water’s edge. The bay was popular with Hawaiian royalty, and a favorite fishing ground of King Kamehameha V.
A shallow fringing reef lies just offshore, with depths up to about 10 feet. 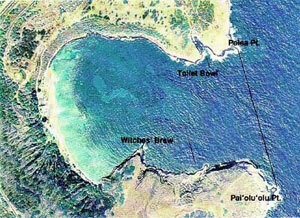 The reef flat extends about 100 yards offshore, and has several large sandy-bottomed areas. Fish are abundant along the reef edges surrounding these sandy areas. Visibility is usually best at low tide and early in the day, before sediment is kicked up by snorkelers. A channel near the bay’s center, dredged for telephone cables, provides access to the outer reef flat. Coral beds are found just outside the fringing reef, especially on the right side. Numerous fishes, particularly schooling species, are found here. Turtles are also fairly common. Water depths range to about 30 feet, and visibility is generally good. The outer bay is recommended only for experienced divers. Depths range up to about 70 feet, and there is a large finger coral reef on the left side. Visibility is often better here than in any other part of the bay. Areas to be avoided, especially during rough water conditions, include Witches’ Brew, a small peninsula and cove on the right side of the bay, and Toilet Bowl (also called Queen’s Bath), a small pool around the bay’s left point. Rip currents in the channel near the telephone cables can be strong, especially during ebb tides. The Moloka‘i Express, a current near the left side of the bay’s mouth, is also hazardous during these conditions. Walking along the wave-cut benches is dangerous during big surf. Lifeguards are on duty year round. To possess in the water a knife for personal safety. To fish for, take or injure any marine life (including eggs), or possess any device that may be used for the taking of marine life. To take or alter any sand, coral or other geological feature or specimen, or possess in the water any equipment that may be used for taking or altering a geological feature or specimen. To introduce any food or other substance into the water to feed or attract marine life.